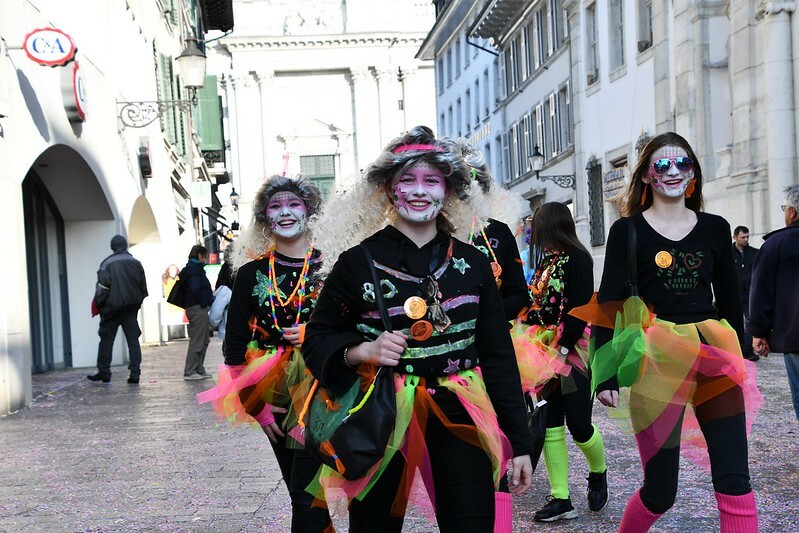 And a good morning from Kanton Solothurn in Switzerland where the carnival season began yesterday morning at 5 a.m. I have been homebound for a week with the dreaded coughing and sneezing and otherwise unwell, but slowly the nights are now reduced to just one long coughing session and I a sleeping again, although I do tend to wheeze when breathing. Yesterday I was determined to venture into the open again and as I approached the town in my wheelchair in the afternoon I could already hear the beats of the drums and trumpets playing their music. 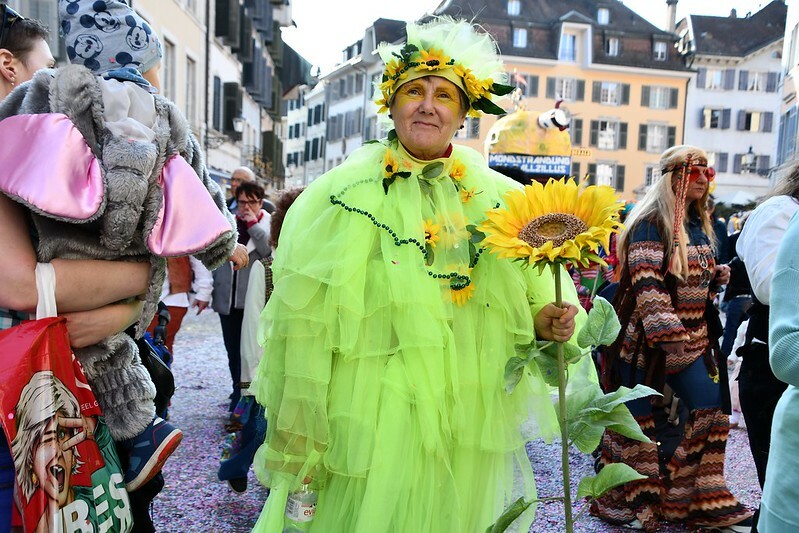 I entered the town and found it full of people dressed in their colourful costumes, throwing confetti everywhere and just enjoying the fun of the season. 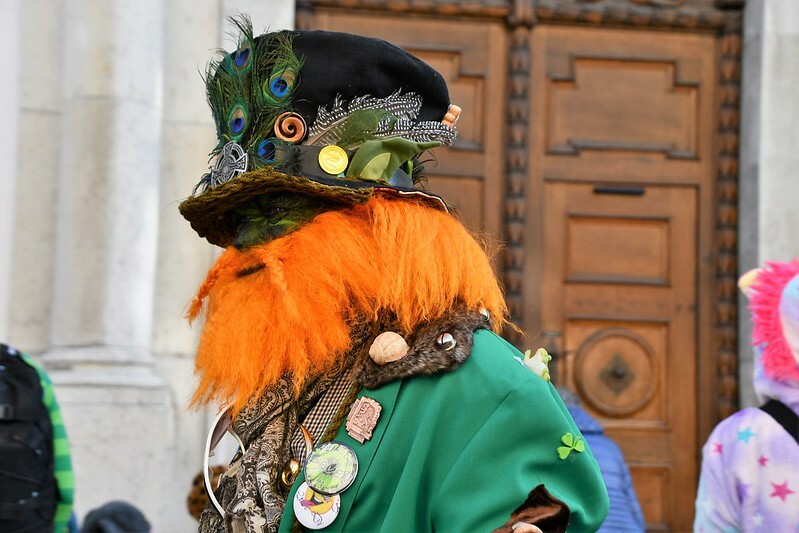 Thursday afternoon is for the general public to dress up and have fun. Especially the kids enjoy being something they are usually not. If it is colourful, then wear it and make sure that you can get some paint on your face. And this applies to all generations. I suppose I could have decorated my wheelchair with flowers and masks and colours, but I decided I was colourful enough. It is a time in our town to lose your inhibitions and mix with the people. As I entered the town a young lady approached me and threw her arms around me and began to talk to me. She had been taking a drink in an outside restaurant. She was fascinated by my cane which I always have attached to my chair in case I might need it. It is not every golden oldie that has one with a colourful flower jungle pattern and she even tried it out. She also had her problems for a while with sclerosis (not the multiple one) and was now in recovery after a lengthy course of cortisone. So is the carnival here, people cast away their problems and enjoy. I had not mixed in the spirit of carnival for many years. I think the last time was when the kids were still kids and then I was the mother that had to go for the enjoyment of the kids. This time I could enjoy the atmosphere and take my photos. The people were so friendly and as soon as they saw me with the camera they gave me a smile for a photo. I was not so sure if this guy was smiling or not, but he was quite impressive. What impressed me was not only did the kids have their costumes, but the parents were also dressed. Carnival is a big thing in our town. 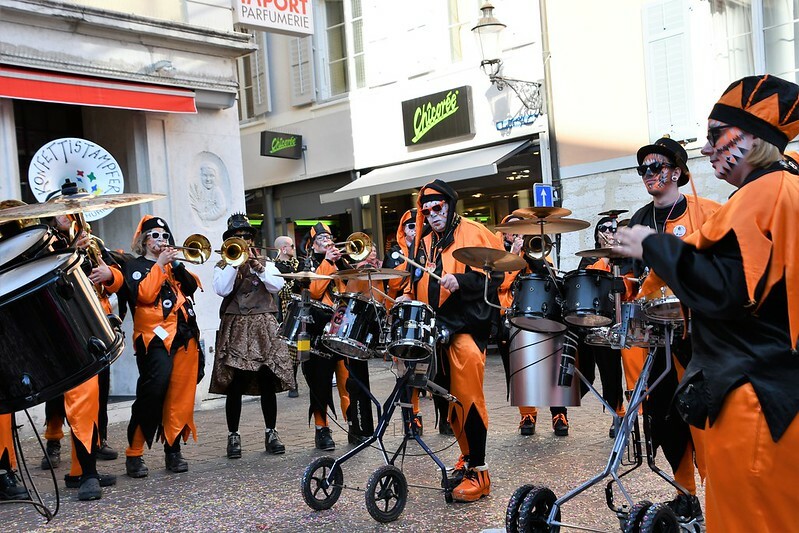 There was music everywhere and the main street packed with people in their costumes. Even the weather joined in and it was warm like a Spring day. After an hour and 98 photos later I decided to move on home. Mr. Swiss was also astonished that I took so many photos, but I really did not want to miss anything. As I began to wheel away from town I cast a look back as I could hear a singer and music in another part of the town. 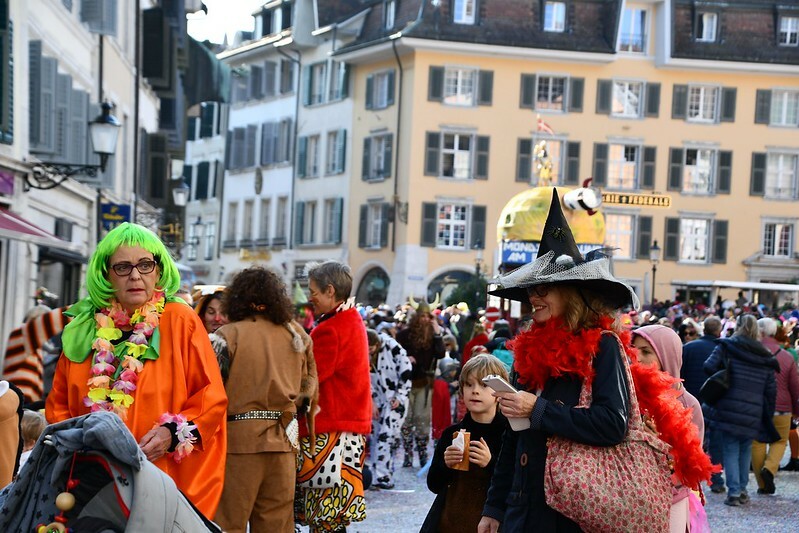 I had not ventured into this part, but the streets were packed with costumed people and otherwise. I was never a carnival person, too much stress, but there are some things as a golden oldie you can now enjoy and let the others celebrate. Today is Friday, and a day where people will probably be recovering from the festivities of the night where they spend the time into the early morning hours in the restaurants in their costumes. That is now more reserved for the active. On Friday evening there will be a few masked balls organised which continues tomorrow. And now to today’s celebrations in the store getting the week-end food supplies. 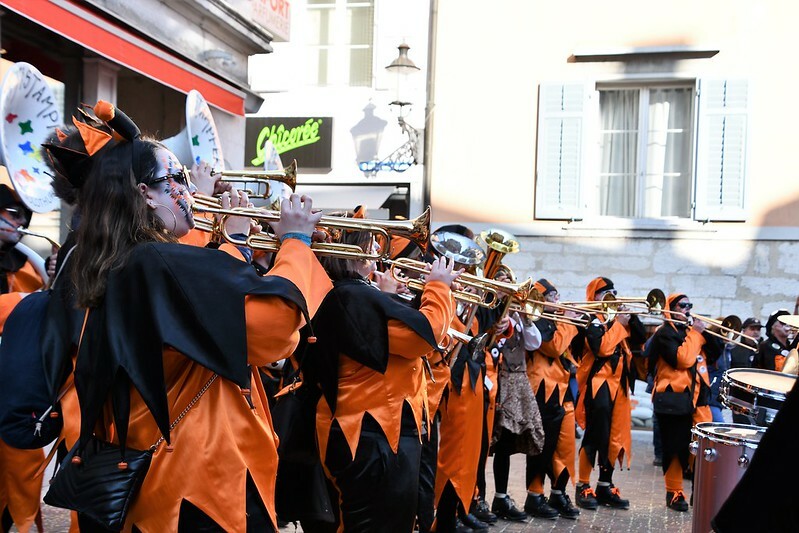 Although the supermarket is in a village just outside of town, they will also probably have some carnival music groups as well to liven up the mood. Today it is raining and now there is some snow mixed with it, but nothing dramatic. Perhaps nature now needs some moisture after such a long dry period of weather. I will now move on and have a relaxing morning, with a few coughs and sneezes in between and a head full of memories of carnival Thursday afternoon. Have fun, see you around. What a fun event and ideal for the photographer. I have many more photos which will be appearing now and again and I hope to take some more. How delightful. I may have mentioned my disdain for many holiday traditions in the past. I really am not so keen on such things, and would prefer to just stay home. This one does not seem so objectionable. It looks like Halloween, but without the objectionable gore and such. So many of the celebrations here are full of those making political statements and protesting something, which is so contrary to a celebration. Yours looks so much like what a celebration should be. When they have the procession they have many speakers on the wagons making jokes about various well known people in town, but all very amusing. In the restaurants in the evening there are groups saying their satirical verses about certain people. It is all part of the fun and it is a very long tradition. It has nothing to do with politics unless you want to make people laugh about various politicians. And if you happen to be taking a walk in town on a carnival day, you will be attacked with confetti and your home will be full of confetti when you get home. Before Christmas, I sort of expect that someone in a group of carolers is drunk enough to barf on my lawn. It happened a few times (not once, not twice, but a FEW times) where I lived in town. So glad you got out to enjoy the carnival, Pat. Your photos are great! I especially like the one of the three ladies walking toward you. There was so much to take photos of but difficult amongst so many people to get the right view: a good opportunity to try out my new camera. I saw one guy who was probably reporting perhaps for a newspaper. He had three Nikon cameras hanging around his neck. What a wonderful tradition and photo opportunity! For old and young alike. Great photos. Hope you feel better! I never appreciated it when I was younger. I just could not enjoy it, it all seemed to me so false. Today it mades no difference. I can wheel into town and take my photos and be the audience. It is a great tradition for those that take part. I just have memories of late nights and people falling asleep in the office. Well at least you can enjoy the photo taking part now! Hope you are getting better soon. 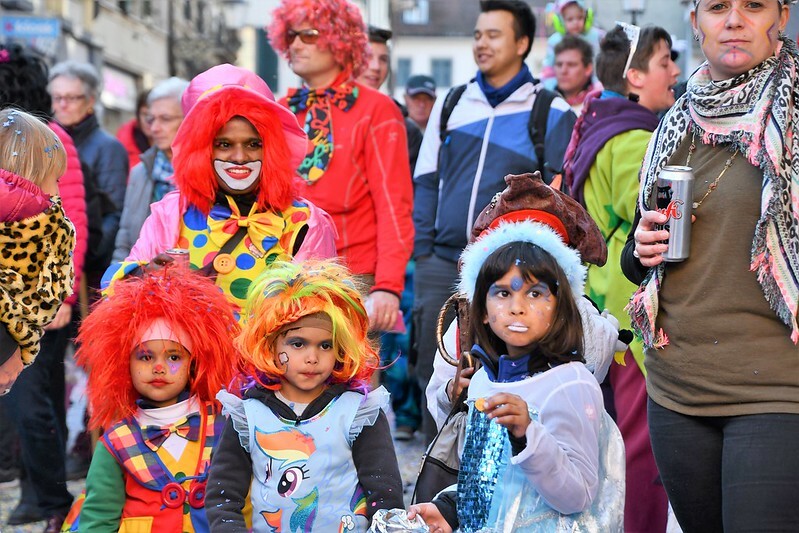 I hate carnival and am so glad I do not live in the Cologne area in Germany anymore where Carnival seems to be bigger than Christmas if that’s possible 😁. I can understand you very well. I have watched the TV programmes at the carnival season “Mainz bleibt Mainz” etc. and I must say the German organisations I find almost like a big business. I do not think that Rosenmontag would be my thing. I am not really a Carnival person at all, but today I just enjoy seeing it in town from a photographic point of view. I could not sit in the restaurants in the evening. 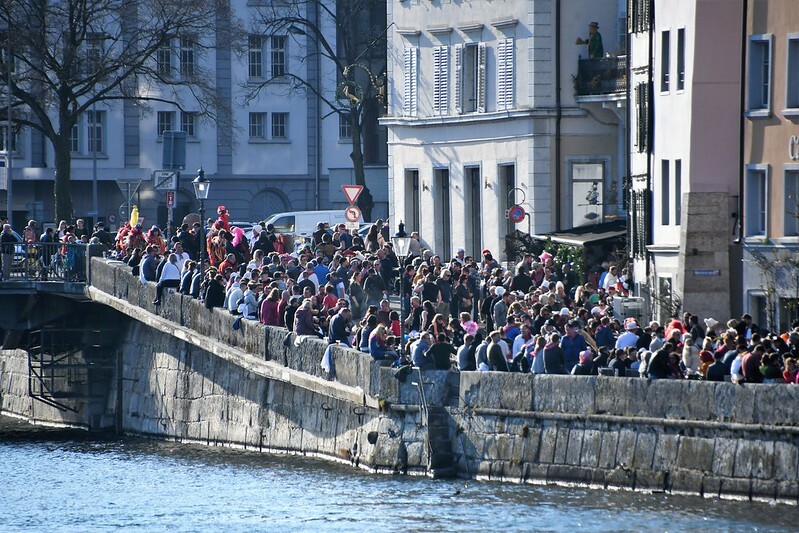 The procession is OK, but too many people and in my wheelchair I would feel crowded. I live in a carnival place, but I can avoid it. All we have to wear is the official badge to watch the procession. They sometimes throw sweets here. Great photos! Sounds like you are allergic to tree pollen, which is very common this time of year. Hazel, alder, aspen are all out right now. Beconase works really well to calm. Sorry, but no way. I have no allergies but a sore throat and fits of coughing. A typical heavy cold. Our pollen count is low here. It is at its worst during the night. Oh that does sound like a cold! I hope it clears up soon and you feel back on form! A great post, so brave of you to venture out by yourself, you are setting the bar high for those of us aging . . . just saying, Congratulations! The wheelchair makes it easier. Mr. Swiss is a few years older than me and can no longer walk so well and no longer drives the car.so I am the only mobile person in the Family, but am managing OK. I have MS but like to keep moving. It helps. I have discovered the good side of People thar hrlp where they can and I like having contact with Others. Organising life to suit the situation has a lot to do with it.